Humans are probably the most evenly balanced of the races. They are not imbued with superlative strengths or weaknesses in offence or defence but can boast a strong cavalry. They also have a rich cultural history of trade and diplomatic machinations. Detractors might call it cunning or guile - and humans certainly excel in these areas. 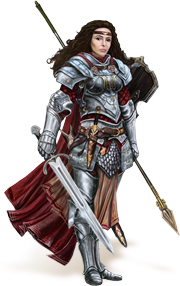 Humans are a great choice of race for a new player to Illyriad as they are the most rounded of races, and therefore allow you to try many different strategies until you find one that best suits your play style. t the start of everything the All-Father made all things that walk or swim, all places in which they dwell, the light and the dark, all things that grow or move, and all the lands and waters and heavens. All things he made by his will, and into all living things he breathed his spirit. To rule above the world he made his Angelium, whom we call the gods. To rule in the world, he made the four great races, and all the lesser beasts and beings below them. Thus it came to be that Men first walked out in the world, to tame the wild places, and to build villages, then castles, and at last kingdoms. Thus it was that the Kingdoms of the First Age rose in an age of hope and promise, but in the face of much blood and peril. Orcs roamed the hills unfettered. Wild beasts ravaged flocks. The work of men was to tame the land, and to defend their people. Men learned to build and to organize their people. At first, men gathered together in caves or small camps, with only crude weapons to guard against wild beast and savage Orc. Then they built temples to the gods, whom in gratitude gave to them the gift of fire, taught them to tame horses, and unlocked for them the mysteries of magic. With their new wisdoms, gifts of other gods, men made finer weapons, and rode to battle on horseback, crafted stone walls and built the first small fortresses. In time, little forts grew into solid castles and into great strongholds, and small camps grew into villages and towns and the first cities. So, there arose great Kingdoms of which now nothing remains.